More characters have been revealed for Toukiden 2. Two of the new characters will be Kaguya and Kuon, who are both shrine maidens. Then there is Yakumo who is a captain in the imperial guard who wields a pair of swords. He protects shrine maidens and is extremely loyal to Kaguya. Lastly, there is Onuhouku, an Oni which dwells in the woods. It’s insect like with a hard shell and uses its sharpened arms to fight. There is also some good news for PS Vita owners. A demo for the game has been available since April 11th, but it was only for the PS4. Koei Tecmo has said that a demo for the Sony handheld will be coming soon, but no date was specified. 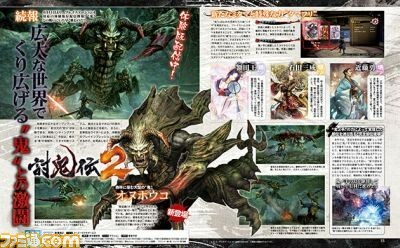 Toukiden 2 will be coming to the PlayStation 3, PlayStation 4, and PlayStation Vita in Japan on June 30.